Eyeing Latinos, NBC News Snuggles Up To Telemundo NBC News' top-rated Nightly News with Brian Williams draws a modest number of Hispanics, compared with the population at large. Network executives see that as a growth opportunity, and they're turning to their Spanish-language sister network, Telemundo, for help in realizing it. This is the second in a three-part series about major American networks trying to appeal to a broader Latino audience. Every morning at 11:45, NBC News officials hold a conference call with their counterparts at sister networks to sort through stories of interest. Among those on the line are executives at CNBC, MSNBC and The Weather Channel; digital news editors; and executives at Telemundo, a Spanish-language broadcast network. NBC News Senior Vice President Alexandra Wallace helps lead the call. She says she relies on Telemundo to keep tabs on stories and events that matter to Hispanics, whether in the U.S. or abroad. "The great thing about Telemundo news is they are flagging us now to stories that we might have heard about, but probably haven't heard about," Wallace says. "That is a really valuable resource for us. There are things that [take] three weeks to work up to The New York Times. It's very nice to hear about them two days after they start being discussed." It's nice, and maybe even vital. It has been more than a decade since NBC, then run by General Electric, acquired Telemundo for $2.7 billion, yet their interactions have been modest at best, especially on the news side. Hispanics are, after all, growing in numbers, influence, wealth and importance. Witness the presence of Spanish-language commercials on prime-time television, the emergence of such Spanish-language channels as ESPN Deportes (sports) and Fox Deportes, and the debut this week of the Spanish-language channel MundoFox, a partnership between the Fox's broadcast network division and a Colombia-based television network. Over the past year, with encouragement from her new corporate owners at Comcast, Wallace has led NBC News executives in seeking to forge closer connections with Telemundo. It started small. 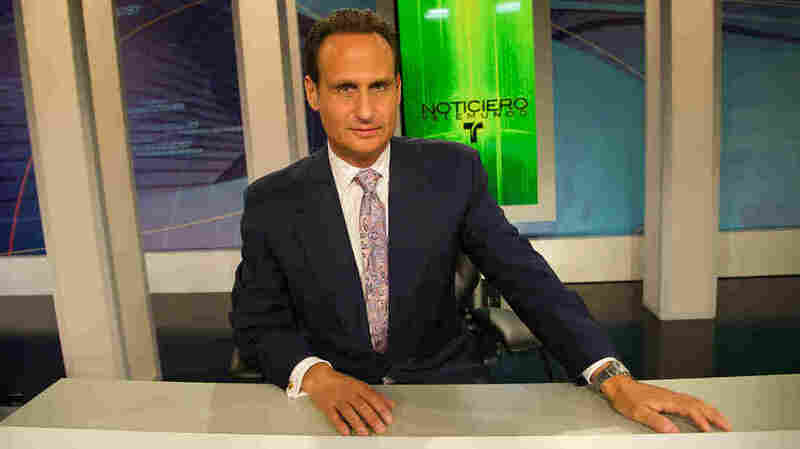 Telemundo's Jose Diaz-Balart, not an unfamiliar face to NBC viewers, filled in as a daytime anchor on MSNBC and appeared with NBC's Brian Williams during a Republican primary debate last summer. He asked Texas Gov. Rick Perry about border patrol and posed a few follow-up questions, but then Diaz-Balart was done for the night. He was thanked by Williams, and left the stage. The sequence came off as a little jarring, but officials at both networks found significance in the appearance. "That was one of the first times that someone from Telemundo had actually been integrated into one of the very important events that NBC had," says Alina Falcon, Telemundo's senior executive vice president of news and alternative programming. "Even though it was a limited role, having his direct participation in that debate was very significant." In June, Telemundo and NBC announced what they called an "unprecedented" collaboration for the rest of the 2012 election cycle, joining in polls, convention coverage and town halls. NBC News and Telemundo officials say they now share logistical help, resources and planning. Telemundo reporters with English-language skills are starting to appear more frequently on NBC and MSNBC, and the same occurs on Telemundo for NBC's journalists who can speak Spanish. Telemundo hired former Mexican Foreign Minister Jorge Castaneda to be a foreign policy analyst, and he has appeared several times on NBC News programs as well. For the first time, NBC's Wallace was also given a direct role in overseeing coverage on Telemundo, which has many loyal viewers but runs second in the ratings to its Spanish-language broadcast rival, Univision. "The Latino market is measured to be over a trillion dollars in purchasing power, and it's growing," says Mark Hugo Lopez, associate director of the Pew Hispanic Center. "It's growing because the Hispanic population is growing." Roughly 1 in 6 Americans is Latino, and that share is likely to rise. The latest census shows that Hispanics account for more than half the growth in the entire U.S. population from 2000 to 2010. But many established news organizations are not successfully appealing to Hispanic viewers. NBC's top-rated Nightly News with Brian Williams draws proportionately fewer Latinos, compared with their share of the audience overall, than his rivals at ABC and CBS. But all of them lag in drawing Hispanic viewers. After all, viewers of evening television newscasts are trending older and Hispanics are a relatively younger population. Executives at all the major networks look at those tepid numbers and see a big opportunity for growth. But political scientist and Hispanic activist Angelo Falcon (no relation to Telemundo's Alina Falcon) says major English-language news organizations simply haven't taken Latino news seriously on a day-to-day basis. "NBC, for example, has Telemundo as part of it, but a lot of people feel Telemundo has been a very marginal part of the whole NBC operation," says Falcon, who is also president of the National Institute for Latino Policy. Yet there are visible signs of cross-pollination. In late July, NBC's Mark Potter reported on the elections in Mexico for NBC Nightly News from Mexico City; but anchor Kate Snow also introduced viewers to Mexico's next president, Enrique Pena Nieto, with excerpts of an interview conducted by Diaz-Balart. The network has also introduced NBCLatino, an English-language site meant to compete with Fox News Latino and Univision's English-language site. NBC's Wallace credits the latest census report for the profound shift in her thinking, as well as that that of her network. "In 2008 this was something that — I don't remember talking about it as much. I don't remember hearing about it as much," Wallace says. "As that population grows, we need to be much more attuned to what is of importance to them."